Commonwealth’s Chamber of Commerce as Pennsylvania’s Business Leader of the Year. Honorary doctorate degrees from Princeton University, University of Delaware, University of Rochester, New School University, Susquehanna University, Eastern University, Widener University, Albright College, Pennsylvania State University, and Drexel University. 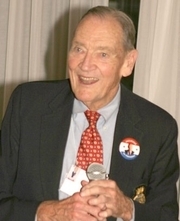 John Clifton "Jack" Bogle (1929-2019) was the founder and retired CEO of The Vanguard Group. He attended Blair Academy on a full scholarship, earned his undergraduate degree from Princeton University in 1951, and attended evening and weekend classes at the University of Pennsylvania. John C. Bogle is currently considered a "single author." If one or more works are by a distinct, homonymous authors, go ahead and split the author. John C. Bogle is composed of 4 names. You can examine and separate out names.